NAU prof James Sexton leads readers through the magical world of Mayan folktales. When an old couple dies in the Mayan highlands of Guatemala, their ghosts haunt their former home, causing problems for the new inhabitants. Clay pots change locations in the night. Beds move as if someone were blowing on the fire. A hairy arm sticks out from under a bed when the residents are eating dinner. Things get worse, even after a shaman is called in to perform magical rituals. Sounds of invisible people sweeping inside the house haunt the owners. The man buys a dog to protect the home, but the family can't sleep at night because the dog barks and barks because of the things it sees. In anger, the man beats the dog, so that it is between life and death and cannot eat. The dog speaks to its master, telling him he is not to blame because, "I cannot sleep because a man and a woman appear to me. The two are old." Before the dog dies, because its master had no mercy, the canine grabs the man and tells him he must now take the dog's place, so he, too, will realize the things that happen at night. The man, now a man-dog, cannot eat or sleep as humans do anymore and runs outside at night to see why dogs are barking. Little by little, he cannot eat and loses weight. He is no longer normal, and suffers. 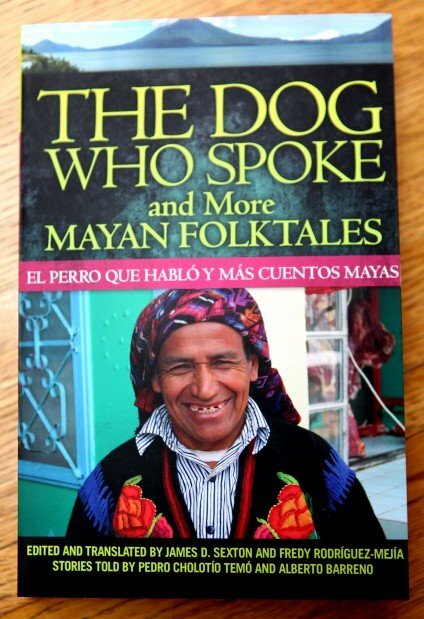 This story, "The Dog Who Spoke," is one of 33 folktales in a new book, "The Dog Who Spoke and More Mayan Folktales," edited and translated by James Sexton, a Regents Professor of Anthropology at NAU. A cultural anthropologist, Sexton has had an active program of research and publication from the highlands of Guatemala for 40 years. It took Sexton 21 years to collect the tales in the book. 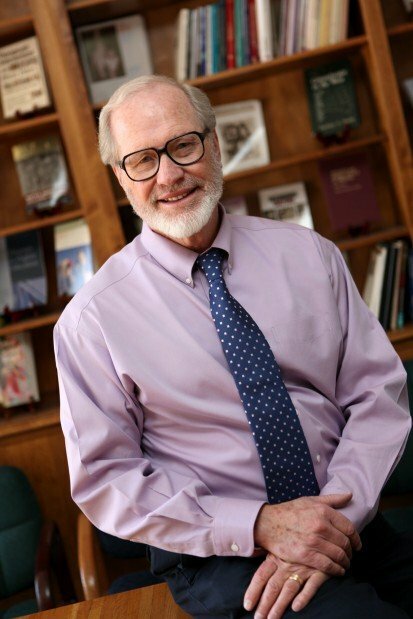 "I think the title story is probably my favorite," said Sexton, who has taught at NAU since 1973. "I can identify with that story. I talk to my dogs all the time. I think they know a lot more than we give them credit for; I think they're very intelligent." In addition to talking dogs, donkeys, crickets, jaguars and parrots, these enchanting tales also feature witches, magical objects, sacred caves, goblins, imaginary animals that lurk at night, and legendary Mayan heroines and heroes. The stories come from the Lake Atitlan region in the Guatemalan highlands, and reflect the dynamics among Guatemala's Indian, Ladino (mestizo population) and Anglo cultures. Sexton received help with the editing and translating of this bilingual book from Fredy Rodriguez-Mejia, a part-Mayan from Copan Ruinas, Honduras, who is a doctoral student in anthropology at Michigan State University. The book includes an introduction to the cultural and historical background to the stories, photographs and maps, and a glossary of Indian and Spanish terms. Sexton said he collected about half of the stories in the book from Pedro Cholotio Temo, a Mayan living in San Juan la Laguna in the Lake Atitlan region with whom he has worked since 1970. He wrote them by hand and sent them by mail or gave them to Sexton on his various trips to Guatemala. Another native research assistant for the book was Alberto Barreno, a half-Kaqchikel Maya. "Eager to collect folktales from both sides of the lake, I asked Alberto one day in 1988 if he knew any folktales, and he said that he knew a lot of them," Sexton recalled. "To my delight, he was a natural storyteller, and I tape-recorded several stories that he told me. He also wrote a number of stories by hand and on a typewriter that I bought him." Sometimes Sexton found discrepancies between the stories he had taped first-hand and the versions he received in the mail. It turned out that Alberto had suffered some memory loss, and his son Carlos was typing up and sending the stories for his father. "That accounted for the difference in style," Sexton said. "Alberto offered me about 280 stories, and I picked the ones I liked the most." All stories appear in both English and Spanish. "Part of my goal is to have a book that students who don't know English can read and learn English, and vice versa," he said. "It also means we can market it in all the English-speaking countries and all the Spanish-speaking countries, so that opens up the market." Sexton said that, although there is speculation on the Internet about the connection between the Hopi and Mayan peoples, the Hopi language belongs to the Uto-Aztecan family of languages, whereas the Mayan languages belong to the Macro-Mayan language family. "I do not know any scholar specializing on the Maya who even discusses the similarities and differences of the two peoples," he added. Current anthropological theory says that the forebearers of all Native Americans entered the Americas in separate waves from North Asia, via a land bridge through the Bering Strait, between 40,000 and 100,000 years ago, Sexton explained in an e-mail. "Contemporary biological studies indicate that American Indians share many genetic characteristics with Asian peoples," he said. External physical differences suggest Native Americans have long been separated from their relatives in Asia. Sexton is often asked about the Mayan prophecy for Dec. 21, 2012, which is the date when the present Mayan Long Count will end. "There is no record or evidence that any traditional Mayan astronomer predicted that there will be an apocalypse at the end of the present Long Count," Sexton said. "Rather, the Maya seemed comfortable with the thought that when the present Long Count ends, another one simply will begin." After all his travels, Sexton always returns to Flagstaff, where he is married to Marilyn Rex, a medical social worker. They have one married son, Randall, and a grandson, Thomas. "My favorite extracurricular activities are alpine skiing, weightlifting, mountain biking, walking and jogging with our twin schnauzers, and growing roses," Sexton added. Betsey Bruner can be reached at bbruner@azdailysun.com or 556-2255.